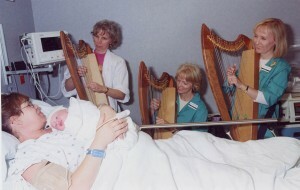 In a therapeutic harp session, the harp and voice are utilized at the bedside (or tableside), to create a “cradle of sound” to help nourish and support clients through transitions in life, birth, and death. Through tuning into vital signs, as well as resonant tone and spiritual essence, Shannon is able to respond to her client with a live musical offering that reflects their personal essence and divine nature. The warmth of this living music can bring solace, acceptance, and grace to challenging and momentous life experiences, and it has been shown to ease physical symptoms such as pain, restlessness, agitation, and labored breathing. The music offers an atmosphere of peace and serenity that can be profoundly soothing for those present. "Shannon played so beautifully, and chose music he would respond to. She has a lovely, calming, gentle spirit, and he calmed down from his anxiety. It was WONDERFUL! Thank you"